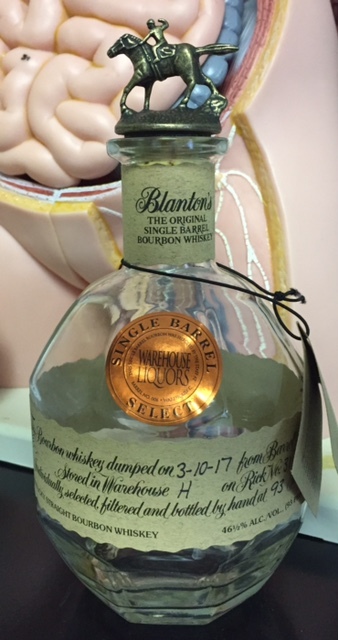 I had only heard about Blanton's store picks, or better yet, read about them on social media and in online forums. To me they had always been nothing more than mythical creatures. But one day I walked into Warehouse Liquors in Chicago, having heard that it's a great source of private select bottlings, and right there at eye level staring back at me was this mythical beast, begging to come home with me. So home it came. I will say up front, that having finished this bottle and being part way through a Warehouse Liquors private selection of Eagle Rare, these people know what they are doing! I have definitely found a go-to source for private bottlings that I can trust sight unseen (flavor untasted?)! Right away I fell in love with the nose on this. It was a sweet amaretto flavor, kind of like almond cookies, along with cinnamon and some light wood notes that made for a nice sweet and savory scent. It was a delicious, pungent smell that you could notice from even a couple feet away. With the first sip, I immediately noticed that this is a sweeter version of Blanton's than what I've had before, but it's a light sweetness, as opposed to a heavy, in your face sweetness. It wasn't sugary, but rather had that sweetness that you get from confectioner's sugar when it's sprinkled on a funnel cake, for example. The bourbon is delicious and smooth, as would be expected from any Blanton's product. The traditional vanilla and caramel are certainly prevalent, along with a nice amaretto tang that carried over from the nose. The sweet caramel and amaretto notes really seemed to linger on the finish for quite some time, often urging me to go in for that next sip or, if I was at the end of my pour, for the next glass. I also found that it had a light and subtle smokiness to it. It wasn't overt, and at times it seemed to almost disappear, but then a few sips later I'd notice it again. This was a complex, and yet simple bourbon, as though it didn't try hard to be special, yet it nonetheless managed to compel me to go back for pour after pour, as opposed to having something else from my stash on a particular night. Warehouse Liquors nailed this one, and I hope they continue getting these mythical beasts into their shop!